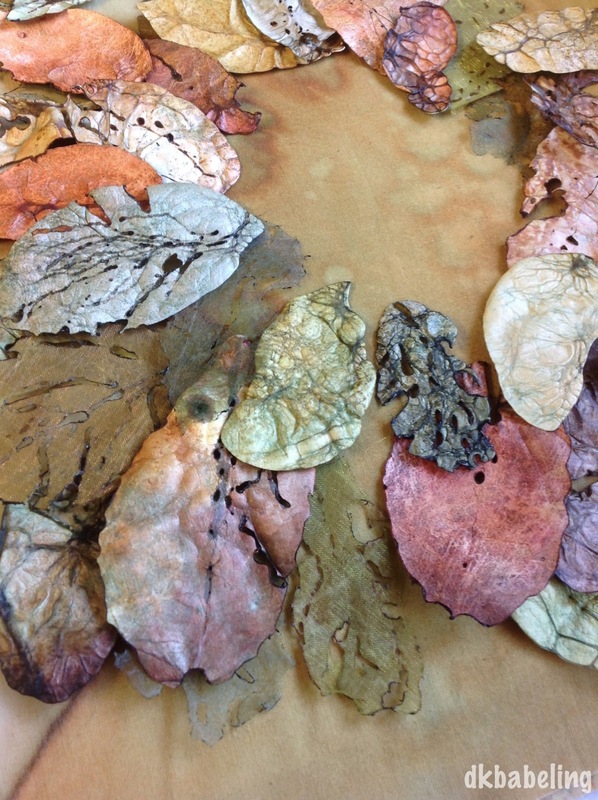 When I chose the theme "Leaves", I had an interior motive -- to corner myself into actually carrying through on a project I had considered for some time. In my back garden is a weeping birch tree. It is a pleasure at all times of the year, but is especially beautiful in early fall, when strands of golden leaves appear amidst the green. 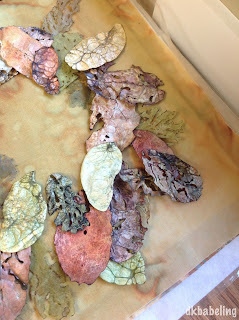 To make the leaves, I coloured Tyvek paper with alcohol inks. Then each leaf was cut out. 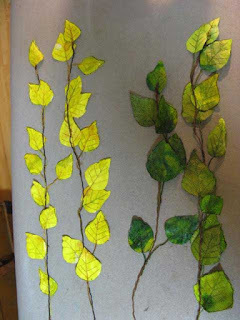 To make the leaf stems, I positioned a small strip of water soluble stabilizer at the top of each leaf, and sewed 4 lines of straight stitching, then "bound" the lines together with a narrow zigzag before sewing the veins on the leaf. The leaves then had to be soaked to remove most of the stabilizer. The leaves were stitched by hand onto fine cords to create the strands of leaves. 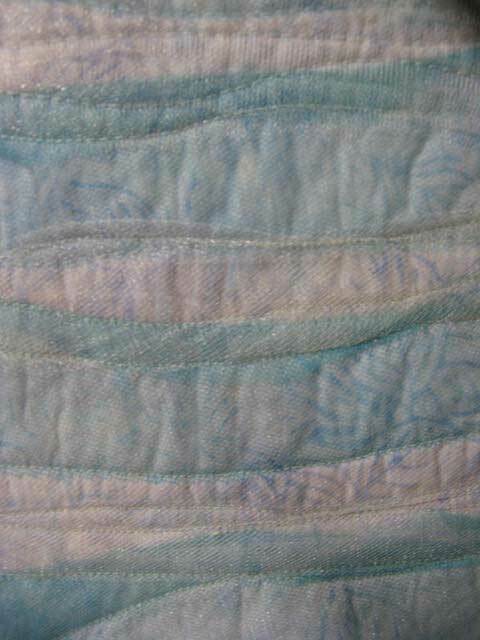 The background is a blue/white batik, fused to a thin batting, then overlaid with sparkling white net and then turquoise net. I stitched lines across it, then slashed the turquoise net and folded it back or removed it, added more white net and sewed it down to create the cloud-streaked sky. Finally the strands of leaves were attached at the top of the hanging. 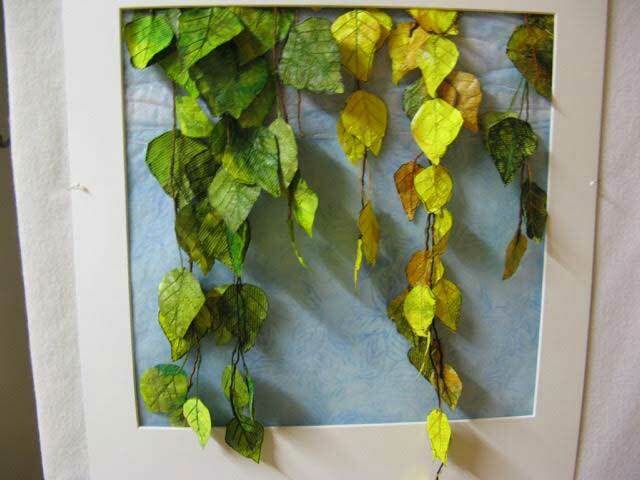 I tacked them down in places, but basically they hang free and can move just like the real leaves. I was very happy working on this. Obviously my well of patience runs deep with this sort of detail, even if it may be somewhat less in evidence at other times! 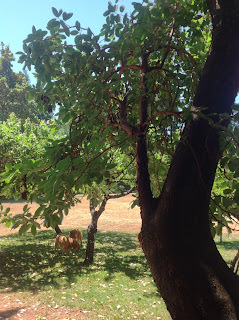 The arbutus tree in our yard is forever dropping something (not the dogs!) - whether it is fruit, flowers, bark, or leaves. Fortunately for us, who love to garden, the tree is in an area where my husband can mulch the droppings into the "lawn", which we do not have. In the winter, we have a "green" and in the summer, we have a "yellow" because we do not water the "lawn". We have had a very early start to what looks like a very long, hot summer this year and the dead leaves are crispy and crunchy underfoot. They are also very colourful - orange, gold, gray, brown, cream. Such a variety of colour from one tree. Confession time! 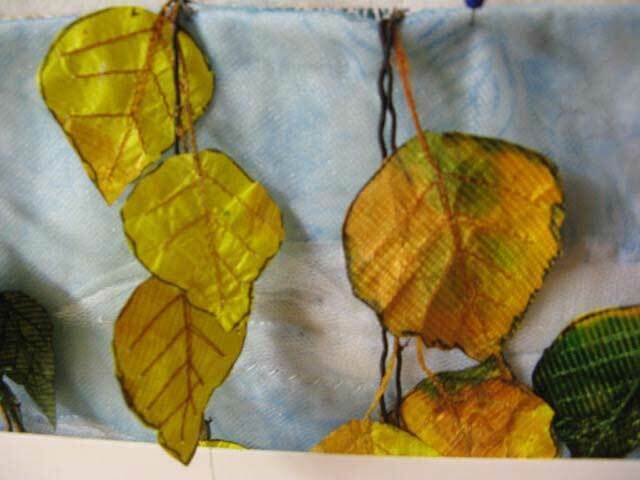 This piece is not finished - as in "the leaves are not sewn to the background yet". I thought it might be fun to post a trial run on Facebook, where, to my great surprise, Kim Thittichai (my idol) asked if she could post my photo on her page - where it has now been shared by others. 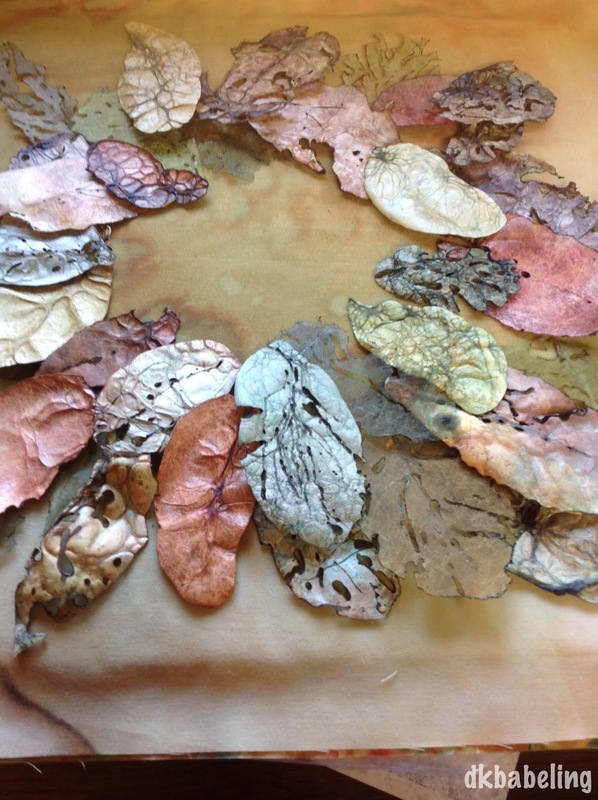 I have been completely overwhelmed by the response to Crispy, Crunchy Arbutus Leaves. Since it has been shared without a watermark, I thought I should get this into cyberspace myself. Tyvek coloured with alcohol ink, cut with a heat tool, Lutradur, organza fused to Lutradur which was coloured with alcohol ink. The background is PFD fabric coloured with alcohol ink. Thanks for this one, Chris! It was lots of fun. I see great minds think alike. We west-coasters love our arbutus trees! This challenge travelled with me and kept me calm and busy at a difficult time. 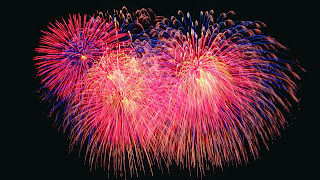 It was started in Manjimup western Australia. I was once again on holidays with my grandchildren. They are three boys and they had chosen to go to an adventure park so I was left with time to myself while they climbed trees, played armies and spies and generally amused themselves. I found several leaves which had just dropped from the trees as we head into winter. The Leaf on the bottom was traced from an actual leaf onto two different colours of felt. I embroidered and beaded over some snippets of crystal organza which was held on by wash away fabric. I put this aside once finished and continue my time with the boys. After a week we headed home and I sat down on the lounge chair enjoying the peace and quiet only for the phone to ring. My dad had taken sick. To cut a long story short he was in hospital for 3 weeks and I kept him and my mum company over that time. The two leaves at the top right came along the third day and took me on and off 2 weeks to embroider with different stitches. I enjoyed playing with the threads and just getting lost in the joy of creating. The large maple leave is my favourite. 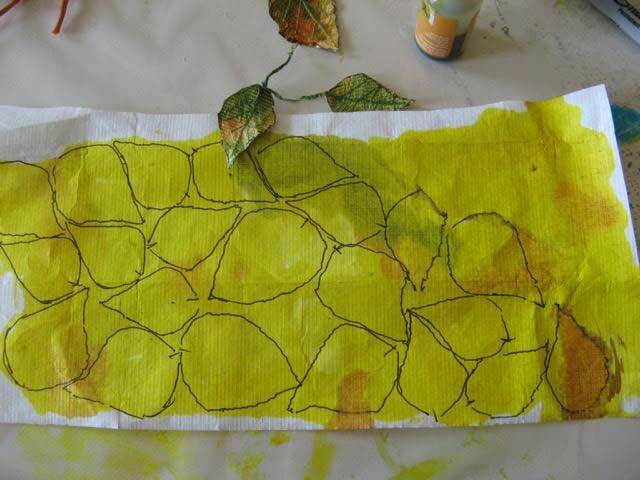 I painted an actual leaf then printed it onto a velvet curtain sample. I then filled in the painted area with matching threads. This was all completed without knowing how I was going to use them. Once Dad was released from hospital and I could get near my sewing room I found the background fabric in my stash. I had bought it many years ago in Canada. I decided to cut, sew and recut then sew again to give the impression of twigs on the ground. The three tiny wooden buttons were a present from my hubby when he was working in Tasmania many moons ago. I had always wanted to use them but there never seemed the right project for them. This one called for some wood, something to represent the trees that give us the beautiful leaves. 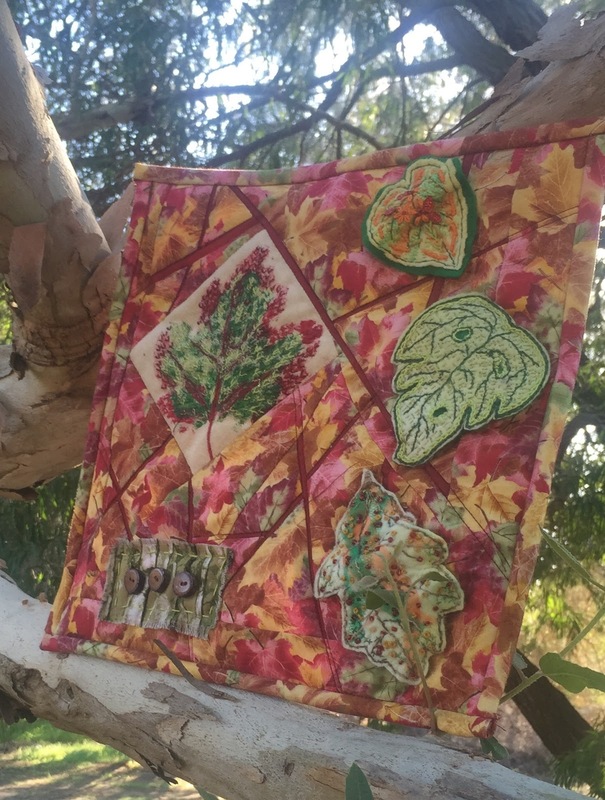 I hunted through my big button box with glee to find them and placed them on a piece of "tree" print fabric from my stash. This piece will always be special to me with so many memories and momentoes in it. Thank you for a lovely challenge. I am now on a 3 month caravan tour heading towards Victoria from Western Australia and look forward to the new challenge quilt to come.